John Carroll has a commitment to financial aid and affordability for our students. We offer merit scholarships up to $25,000 annually, which reward academics, leadership and commitment to service. We award nearly $36 million in financial aid each year. Our need-based financial aid helps families from across the economic spectrum be able to enroll and graduate without significant financial burden. Almost all of our students receive scholarships and/or need-based aid. We know that college is a big investment. When you choose John Carroll, you can feel confident that you’re getting a great value for your tuition dollars. 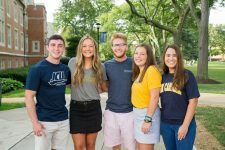 The John Carroll approach to helping you choose to enroll is unique. Your Enrollment Manager (EM) is your primary point of contact with John Carroll and will act as your resource, guide, and advocate throughout the entire enrollment process. Your EM will assist you and your family now through New Student Orientation in the summer. Your EM is cross-trained in admission and financial aid and can handle most of your questions without sending you through a maze of other offices. Filing for financial aid does not need to be a complex process.